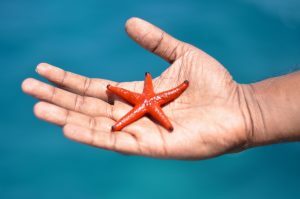 Have you heard about the guy walking along the beach throwing starfish back into the ocean when along comes a stranger that asks why he is doing it. 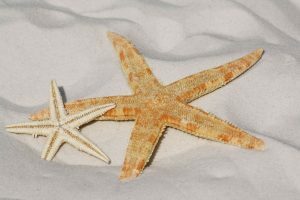 The man replies that each starfish is special and deserves to live. The stranger looks around and sees hundreds of starfish and turns back to the man, with great mockery he says, ‘You aren’t even making a dent‘. To that the kind hearted starfish rescuer replies ‘To that one, I made a difference‘ as he tosses another one back. ‘And to that one‘, and he tosses one more. I’m my own reminder of what I’m not doing. I love this story and find it inspiring every time I hear it! Today however, today it landed on my heart in a whole new way! I’m can be much more like the naysayer walking down the beach by getting overwhelmed with the things I can’t accomplish. The things I can, I do them and move on. Those I don’t get to seem to mock me, much like the stranger did to the man. I’m my own reminder of what I’m not doing. Today I got to be the one throwing starfish back! You know, there are billions of people in this world and we all hustle and bustle our way through the day. Each of us with our To-Do list running through our heads almost as soon as our eyes open! Busy lives sometimes leave out stopping and being thankful for all of the wonderful things that make us busy! When do we fit in our busy days time to stop and look around us and just simply say thank you? The next time you find yourself complaining about something (like a difficult job or boss), stop and write down ten things you are grateful for. Just ten. Need a little help? Take a deep breath and tell say out loud, “I am so thankful, grateful and blessed for __________.” It’s ok to start small. Starfish aren’t very big. I love to help people. I know God put me on this Earth for a reason and He gave me a specific set of gifts that I’m to use to be the hands and feet of Jesus. I’ve spent the last fifty years trying to figure it out. Today, there are tears in my coffee. Why? Today I figured it out. It’s that one starfish. And then that one. And then that one. ONE!!! Not all of them and not as many as I can carry. That one. That special, beautiful, unique, alive, amazing creature. I can help that one today. That’s what He asks of me and that’s what I’ll do. AFT Certification and lot’s of love is how I help one person at a time! I’m an AFT Certified Practitioner and I share with people to help them put words and action to what they really want. It is an amazing blessing that I’m truly thankful for every day. I’ve been working with this one awesome woman and to see her release a heavy anchor and soar just makes my heart sing. For her to take time to think of ME today, filled my heart with Joy! I made a difference to one person, for one minute or one day or one week…. it doesn’t matter. What does matter is that I allow my light to shine and that I’m thankful. And that’s when it hit me. 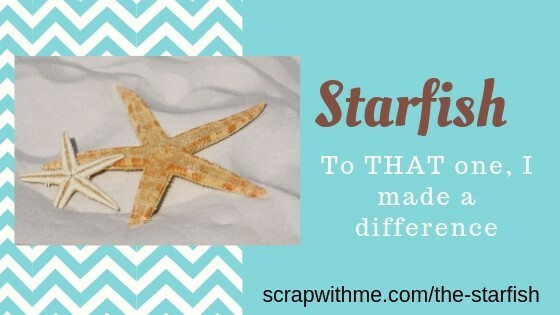 The Starfish parable landed on my heart and I understood it in a way I never had before. Hence the tears. Tears of joy, gratitude and humbleness. I’m so thankful. When someone cuts you off in traffic, understand they probably didn’t do it on purpose. Maybe they are rushing an on the way to an emergency or hurrying home because a loved one isn’t answering the phone. Perhaps baby girl got hurt at daycare or the test results just came in. Don’t assume the worst of them, give them the best. Throw that starfish back. So, When someone says something sharp today, say a payer for them. It’s not you. It’s them. It’s their pain, it’s their baggage, and/or it’s their loss. 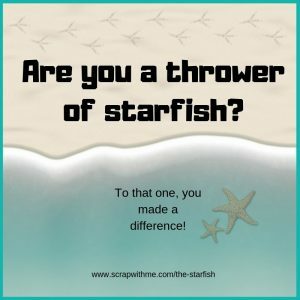 Step back and see them as a hurting, gasping little starfish and be willing to give two seconds of your time to save them… and you. Throw that one starfish back!